Union Grove Middle School is in the Henry County School district, just south of Atlanta. The UGM Library Media Center is both a virtual library, available 24/7, and a physical space that houses materials and a wide variety of activities to support its mission. The mission is threefold: to promote reading as a foundational skill for learning, personal growth and enjoyment; to provide and promote research resources that address multiple literacies, including information literacy, media literacy and technology literacy; to provide a well-managed, safe and welcoming environment, including flexible and equitable access to physical and digital resources and encourage respect for all. With the exception of the physical books and equipment, the UGMS virtual library provides access to all the LMC services and information resources. Besides giving access to the online databases like the Destiny catalog, e-books, GALILEO, Newsela, etc., the LMC website contains curated web pages for specific assignments and projects, instructional pages like “How to Cite” and links to services offered, like “Request a Book.” It also contains links to outside information sources, like the Public Library System and web sites for parents. The physical space has always operated as a Learning Commons, but the recent renovation enhances these activities. The LMC is used in many different ways before, during and after school, by individuals to large groups. Students come to video and audiotape or to work individually or in groups and classes do presentations, so flexibility was the guiding principle in the renovation. Now students no longer have to videotape between the bookshelves in front of green poster paper tacked to the wall since a large, permanently installed green screen is available in the alcove. All students in Henry County Schools are now issued chromebooks so all but four of the desktop computers were removed to allow more table space. Two of the desktops have the video editing software Pinnacle installed on them. Six individual, wheeled tables with whiteboard tops and wide based stools have replaced some of the heavy library tables. They can be lowered or raised, used as standing desks, grouped together or used individually. Casters were installed on the rest of the library tables making them easy to move quickly. A ceiling mounted projector, speakers and a wall screen were installed and four low bookshelves removed to open up the space that now allows all 120 seats to be directly in front of the screen. 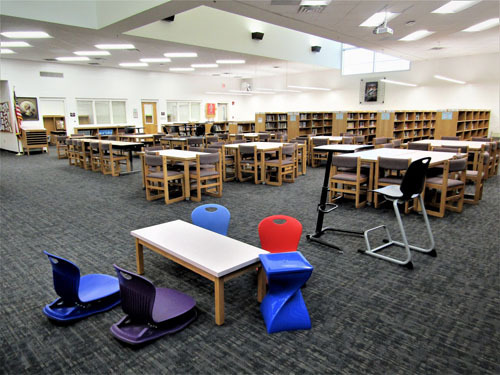 Colorful molded plastic floor rockers, that are stackable when the space is needed, replaced the bulky upholstered ones, while still allowing the students to enjoy rocking. Heavy duty, double sided portable whiteboards on wheels replaced the stationary whiteboard easels. The makerspace was moved out of the alcove and closer to the circulation desk where help is more readily available, since the librarian media specialist is often the only staff person. Word on the Street Library Bike in the Spotlight!